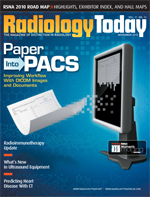 Until relatively recently, workflow efficiency has been defined by what a radiologist can do in the office. But with the rise of smartphones, some radiologists have begun exploring these handheld tools to increase productivity. One application that allows Web functionality is Merge Healthcare’s eFilm Mobile, which was released in March. It can connect up to 15 eFilm-enabled workstations and allows radiologists to remotely view their eFilm Study Manager from their iPhone, in much the same way as they would check their e-mail. Merge is currently working on an updated version of eFilm Mobile that is expected to allow users to view their study manager on iPads as well. Other PACS companies have developed their own smartphone apps as well, though none has received approval for diagnostic use. Although many physicians have incorporated smartphones into their workflow, the engineers at Apple probably didn’t have radiologists in mind when they began designing iPhones. Radiologists are often technophiles, but smartphones’ screen sizes are not conducive to displaying diagnostic images. Since the FDA has not yet approved any smartphone application for diagnostic use, eFilm Mobile uses a nondiagnostic viewer without measurement tools. The images are full-resolution PNG (portable network graphics) files, and radiologists can pan, zoom, or adjust the window level. However, they are not diagnostic quality as defined by the FDA and are not meant to be used for making diagnoses. eFilm Mobile runs through the eFilm Workstation, a thick-client, diagnostic-quality, FDA Class 2 medical device that is downloadable from Merge Healthcare’s website. It can be used as a primary diagnostic workstation or integrated with a PACS. It can also be used for CD/DVD burning, for printing DICOM files, or as a technologist review station. Desrude cites the ability to quickly check patient positioning as an example of additional mobility. If a radiologist is away from a workstation, he or she can look at it from an iPhone. If the positioning is correct and a rescan is unnecessary, the patient can be sent home immediately rather than waiting for the radiologist to return to the office. Also, users can remotely direct studies from the workstation. Radiologists can download studies from the workstation to the study gallery on their iPhone for use when a wireless connection may not be available, such as during a patient review with another physician. Or if a radiologist doesn’t have access to his or her workstation and some urgent cases pop up, the radiologist can use eFilm Mobile to send the studies to a colleague’s diagnostic workstation. “You can pull up a study and, if you cannot get to it, you can remotely control your eFilm Workstation at your office to do a DICOM send to another workstation,” says Desrude. In addition, with the increasing emphasis on faster turnaround times, referrers expect reports to be available when they need them. Many large-volume hospitals and imaging centers rely on Web-based distribution for communicating results. Lower-volume sites, including specialty clinics, are increasingly using Web-based distribution to replace courier-delivered and fax-based report distribution. Merge Healthcare’s Clinician Access Portal, which debuted at RSNA 2009, allows for faster distribution of results from radiologists to referring physicians. With eFilm Mobile, radiologists can send reports from their study manager to the Clinician Access Portal to allow referring physicians to access patient data, including images, via a zero-client Web viewer. The viewer is browser based and does not require additional ActiveX downloads, Java applets, or plug-ins. Images are rendered on the server directly to the browser, and the viewer works with any browser. Reports are sent via a Health Level Seven International interface. Referring physicians securely log on to view their patients’ studies, and the radiologist can set up the permissions that stipulate what information can be accessed and log all of a referring physician’s activity on the site.